Vista del Mar is the epitome of elegance and grandeur. 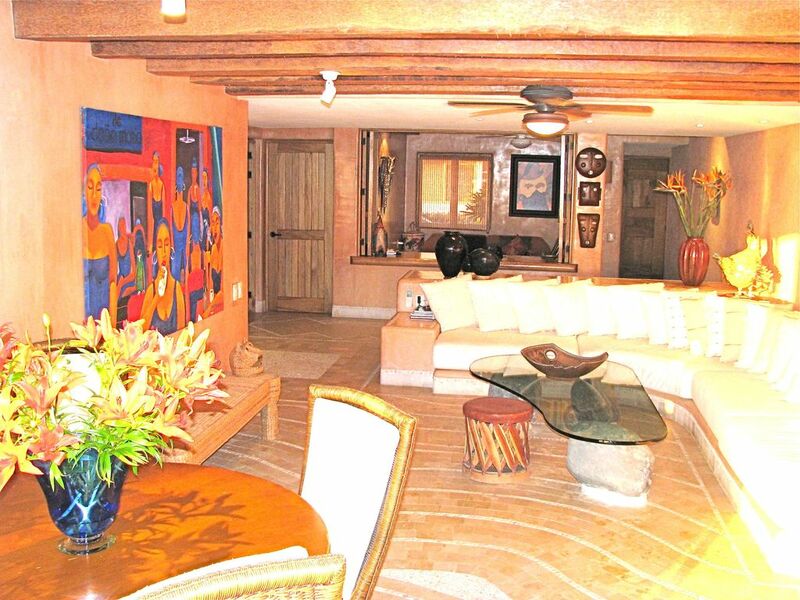 Designed and decorated by world renowned architect Enrique Zozaya. Folding glass wall between living room and terrace disappears into side wall allowing a sweeping view of the ocean from the front door. Master bedroom opens onto terrace with a private infinity pool. Two bedroom and den with DSL, Vonage phone, and stereo with ipod connection. Kitchen is fully equipped with everything needed to prepare a gourmet meal. Five minute walk to La Ropa beach. Spend your days on the beach, at one of two pools or in the luxury of your own private pool. We have been traveling to Zihuatanejo every year since 1991. We used to stay at Villa del Sol and Las Palmas. Ed finally decided he wanted to make this our second home and now we are sharing it with you. From the moment we got off of the elevator and walked in the front door, we were in love. It got us at hello and it will do the same to you. Our terrace is only one of two in the entire complex with a pool that is open to the sky. It is a great place to spend the day or a great place for a sunset cocktail. Our past guests have all said the hardest thing was leaving the terrace each night for dinner. This place is amazing! The VIEW is stunning! From the moment we arrived until the sad moment we left we loved the condo, the property, the staff, the beach and Zihua as a destination. When you first walk into the condo you have this AHHHA moment when you look out over the balcony to see the property, ocean and beach below. The unit is a first class property will all of the amenities of home, and an awesome guide to everything Zihua we called The Bible - written by the owners. This was our first visit and we definitely be coming back. Thanks Tom. I am glad you liked the "Bible", I hope it makes visitors able to find everything they need easier. I like the restaurant guide in the "Bible". It makes me have to eat at all of the included restaurants just to be sure they are still great. They say pictures are worth a 1000 words. Not in this case! Pictures do not do justice to the breathtaking views from this condo! Sheer beauty! The condo is AMAZING! The owners think of everything. Details from guidance thru the airport on your arrival to the "Guide to Everything Book" left in the condo. This book navigates you thru the condo, restaurants, and things to do in Zihua. Truly a wealth of information. We love to read all the restaurant recommendations that the owners leave. They are always spot on. Their home is beautiful, comfortable & well cared for. We were so happy to bring friends of ours who had never been to Zihua. One step thru the door & they fell in love just as we had! Zihua is a safe, relaxing & beautiful. There is so much to do! Snorkeling, fishing, shopping, eating, long days on the beach! Our first night, we love to go down to La Perla & get our toes in the sand and eat on the beach. One of our favorite days is to take a boat over to Las Gatas. Only reachable by boat, we love to spend the day sitting in beach chairs in the water, swimming & enjoying fresh fish and magaritas. After a long day on the beach, we head back to the condo for a happy hour in the private pool while watching the most INCREDIBLE sunsets! We have been blessed to spend 3 vacations in this condo & have already planned our next visit even though we just got back! This makes me miss our home even more than I usually do. We loved this condo. It has its own pool on the deck and an amazing view of the Bsy. Very clean and well equipped. The complex is safe and beautiful and the staff is so helpful. We took taxis everywhere and could walk to the beach. Our favorite beach hangout was Patty’s and the Loot Great food. The beach is beautiful. Loved this condo. Thank you for your review of our condo in Zihuatanejo, Mexico. Please remember us for a future visit. We really enjoyed our stay at la Casa Que Ve Al Mar. The condo was wonderful, the pools, landscaping and location are all perfect. The condo is well furnished and the owners very accessible and helpful with all our questions. We found many good and affordable restaurants on Playa la Ropa and in town, we enjoyed the yoga classes at Paty's spa and loved strolling through the Mercado Municipal in Centro and the Mercado Artisanal on Avenida Cinco de Mayo. Most amazing was the view from the condo, not only at sunset but at anytime, day or night. Thank you Barbara and Ed for sharing this gem. We are glad you enjoyed your stay with us. Please think of when you think of returning to Zihuatanejo. Amazing! Breath taking! Perfectly wonderful! I cannot say enough about this place. It was heaven on earth. To start from the beginning, Barbara was very easy to work with and was a wealth of information, since we were first timers. We received a step-by-step packet with recommendations on where to eat and what to do. All the research I had done prior to seemed pointless because Barbara had everything we needed in our "Arrival" email! We arrived just before sunset and were blown away when we arrived. The view is stunning! We were greeting when we arrived and shown to the unit. The open air design of the unit is just wonderful! The walk to the beach (La Ropa Beach) is very easy, and as another reviewer stated, if the walk back is too much (which we thought of it as our "exercise") the taxis are right there to help! We also found a great bar towards the end of the beach that put the Seahawks on for us. (Double plus)The patio is nice and private. One evening we had the house cleaner cook dinner for us. It was by far the best meal we had while in Zihua! AND there was enough leftovers for lunch and then some the next day! We made some great new friends and plan to go back. Sounds hard to believe but the pictures DO NOT do this unit justice!! Thank you Barbara for sharing your home with us. We are already trying to plan our 2017 visit. Thank you for your kind words. I do agree that is difficult to describe how beautiful it really is until you see it. Hurry back! Spent two months in this lovely condo. Amazing views overlooking Playa La Ropa. Very comfortable & convenient. Great staff--always ready & willing to help with anything. The owners are very accommodating & easy to deal with. Condo is very well stocked & very clean. Beautiful place to spend the winter.